John graduated from the University of Limerick in 1992 with a B.Eng. in Industrial Engineering. 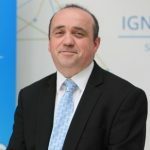 He has worked in both engineering and information systems roles for 25 years with focus over the last 10 years in innovation and product development within the Agri Tech sector. Prior to entering the agricultural sector, he worked in the engineering and pharmaceutical industries where he built his experience in Lean Manufacturing, Engineering Design and Information Systems. In 2005, he joined Keenan in Ireland (manufacturers of Ruminant Feeding machinery) where he led a team that developed the Keenan InTouch Internet of Things solution which connects thousands of machines around the world to a team of Dairy and Beef nutritionists, whose key focus was delivering improved performance to farmers and throughout the supply chain through its precision feeding platform. In 2016, John joined AB Agri as Head of Agri-Data Services to develop the AB Agri Data Services Platform, which integrates precision farming technologies together with AB Agri technical expertise to ensure the value of data is maximised and turned into actionable insights, delivering reliable outcomes.